Enabling Pre-Orders for your online store is a wise move. This action would allow customers to purchase the item they want even if it is not momentarily available or stocks are yet to be replenished. You can set Pre-Order settings that will apply to all products across your entire online store. This setting will apply to all those products that have no specific individual pre-order settings. STEP 1. Launch the app and click General Settings. STEP 2. In the Pre-Order Status field, choose Enabled. STEP 3. In the Design Settings section, click on the Pre-Order Button tab. STEP 4. In the Button text field, enter the text that you want for the button. By default, the button says Pre-Order, however, you can modify it and put in any text as you want it to appear on the site. In this example, we change Pre-Order to Order Ahead. STEP 5. Click on the drop-down arrows to choose the Background, Text, and Border colors. In this example, we choose green for the Background, and white for both the Text and the Border colors. STEP 6. Adjust the text size, border width, and border radius of the button by dragging the slider to your desired setting. STEP 7. 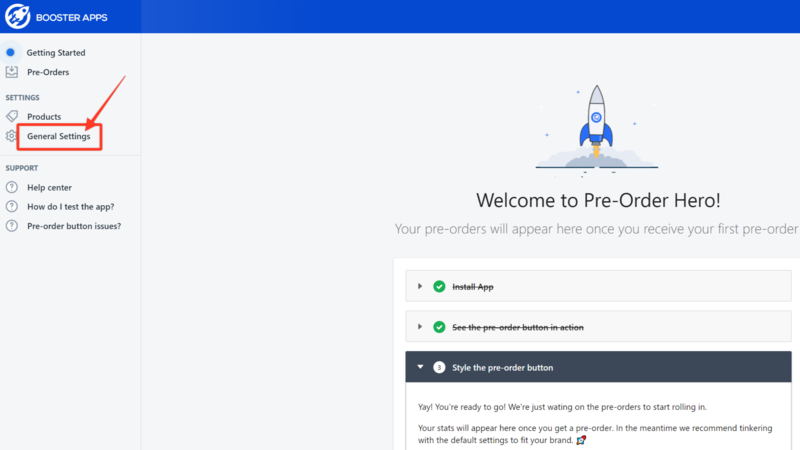 Preview the Pre-Order Button that you have created. You can modify any part of the button such as the text, its background color, and its border according to your preference. STEP 8. Click the Pre-Order Button Hover tab. STEP 9. Click the drop-down arrows to choose the Button hover, text, and border colors. In this example, we use green for the Button hover and border colors and white for hover text color. STEP 10. Click the Tooltip tab. STEP 11. In the Tooltip Text field, enter a phrase or sentence that you want to appear when you hover the mouse to the Order Ahead button. In this example, we entered You'll sure to get one as soon as it is available. STEP 12. In the Tooltip position field, choose which part of the Order Ahead button you want the tooltip to appear when the mouse hovers it. In this example, we choose Bottom. STEP 13. 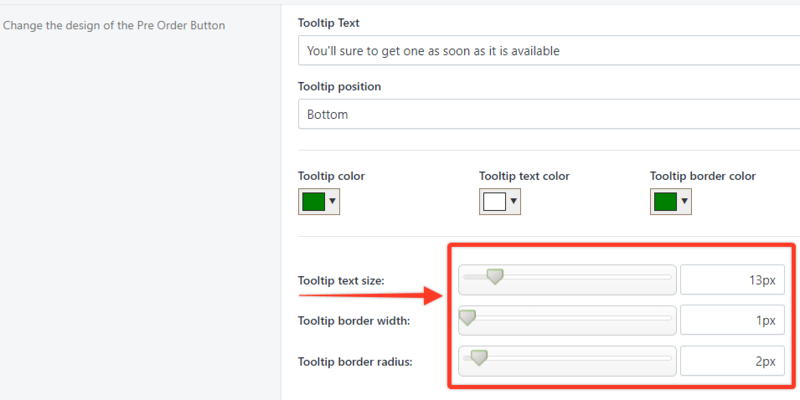 Click on the drop-down arrows to choose the tooltip color, text, and border colors. In this example, we choose green for the Tooltip color and border and white for the text. STEP 14. Adjust the tooltip color, tooltip text, and border colors by dragging the slider to your desired setting. STEP 15. 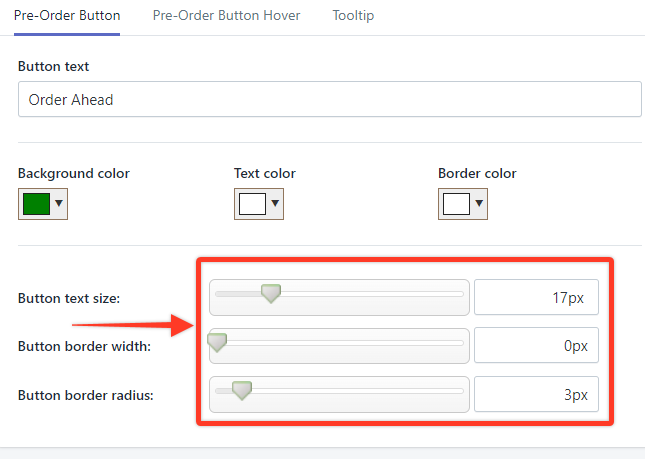 Preview the Pre-Order Button that you have created with the Tooltip. You can modify any part such as the text, background color, and borders according to your preference. STEP 16. Click Save Settings.